This book has been written for those who want to learn more about the nonprofit sector or improve their knowledge and skills related to nonprofit leadership, management and fundraising. Peer-reviewed articles selected for inclusion in this book have been contributed by nationally known experts within the nonprofit sector. * Explores planning issues that are often a challenge to nonprofit organizations. * Provides models for improvement of management, governance and leadership. * Presents best practices related to the science and art of fundraising. 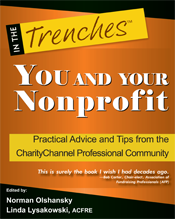 * Addresses many of the day-to-day issues that confront nonprofit leaders and professionals. * Provides practical and replicable problem-solving suggestions. The contributing authors cover a variety of subjects. You will learn about planning issues relating to governance, fundraising, administration and marketing. You will learn about leadership, and other topics as well. The editors’ goal is for you to enjoy reading about nonprofit management, leadership and fundraising and in the process learn ways to add value to your own work as someone who is, or will be, engaged in the nonprofit sector. Because the contributing authors are members of the CharityChannel professional community, you may connect with them via their respective CharityChannel pages, enabling you to ask questions, engage in a dialog, obtain more information, and tap into additional resources that will help you. In fact, the book provides each author’s CharityChannel URL following each article, just to make it easy to connect! This book has been written for YOU!